With beautiful bedrooms combining historic charm and modern style, not to mention an enviable location overlooking the ocean, The Royal Hotel in Deal invites you to enjoy a special stay on the Kent coast. Whether you are looking for a relaxing, romantic retreat or the perfect base from which to explore the area, we have just the room for you. You can discover our available room types below. All come complete with modern conveniences such as wifi and flatscreen TVs, and little extras like a hairdryer and tea and coffee making facilities. 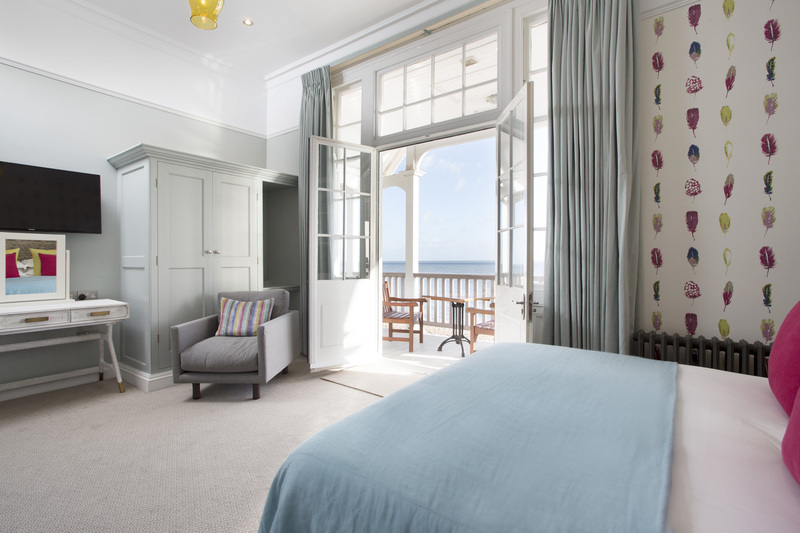 Some of the finest accommodation in Deal, our feature rooms are the perfect place to unwind - featuring luxurious design, supreme comfort and fantastic sea views from their private balconies. Our spacious superior double and twin rooms are a haven for quality and comfort, ensuring your stay in Deal will be everything you dreamed of - with stylish cream décor and warm fabric accents offering understated refinement. Decorated in soft, relaxing shades and complemented by subtle furnishings, each of our standard double / twin rooms offer high quality facilities helping to make your stay ideal in every way. Here at the Royal Hotel we like to pride ourselves as being a haven for quality and comfort and we are well equipped to cater for families too, with a selection of family rooms sleeping 2 adults and up to 3 children. Decorated in natural tones, our single rooms offer total relaxation in stylish surroundings, complete with a full range of quality facilities.